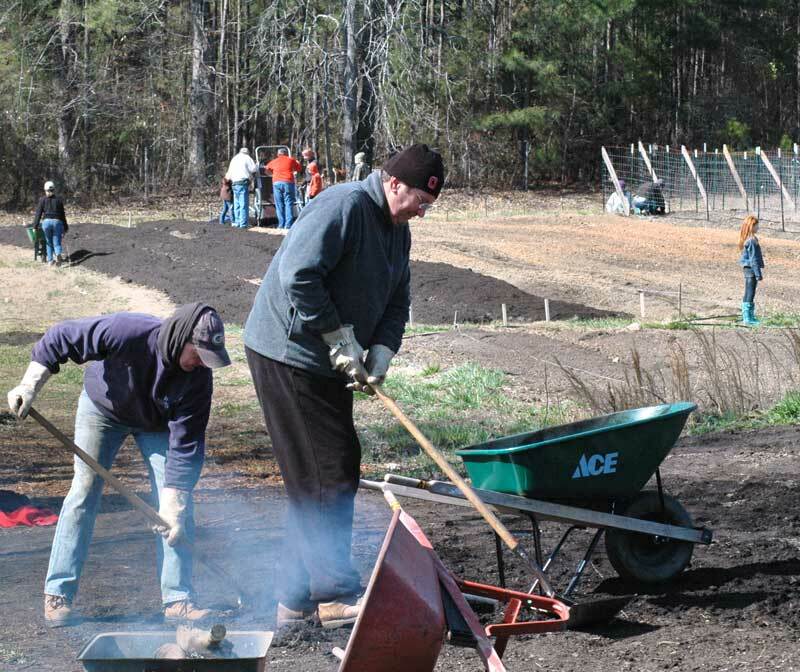 Temperatures in the upper 30s and winds of 20-30 miles per hour on Feb. 11 could not deter nearly 100 people from six counties across metro Atlanta from helping with a variety of chores at the non-profit 180-degree Farm’s “Cropstock” volunteer work day. Located near Sharpsburg in east Coweta County and operated by Fayette County residents Nicole and Scott Tyson, the nearly 15-acre farm is beginning its third year, having come into existence as a way to provide a benefit to the community after the couple saw how organic food had served as a healthy and successful alternative to chemotherapy for their youngest son. The volunteers on Saturday helped out with a variety of chores. That work included hauling endless wheelbarrows piled high with organic, vegetable-only compost that was spread in the fields in preparation for the upcoming spring planting. “We’re very, very blessed to have this many of you show up on a cold day like this,” farm president Scott Tyson said at lunch time to the nearly 100 supporters traveling from Fayette, Coweta, Henry and Spalding counties and from as far away as Lawrenceville and Gainesville who braved the frigid winds to lend a hand at the 180-degree Farm Cropstock volunteer work day. Farm executive director Nicole Tyson said she and Scott felt led to do something more than just grow food. They wanted to give a helping hand up to those in need. “We believe in giving fresh grown food to the local food ministry, but more importantly, teaching through our workshops how to grow food on any plot of land. Times are tough and getting back to the basics is not an option anymore, it’s a necessity,” said Nicole. The impetus behind starting the 501(c)(3) farm on what was initially a 10-acre property they had purchased off Ga. Highway 154 in east Coweta rested with their youngest son, then-3 year-old Mason. The couple had originally purchased the acreage a few years back as the site for their dream home. The property came complete with a pond and enough land to greatly expand the garden they had begun in their backyard near Peachtree City. But things changed in 2006 when Mason was diagnosed with stage 4 cancer. Though the neuroblastoma in his abdomen was removed, Scott and Nicole declined the chemotherapy recommended to treat the cancer in 8-10 nearby lymph nodes. Their reason for declining the chemo was because the therapy could lead to kidney and liver failure, leukemia, hearing and tooth loss and a possible heart transplant. The couple had already been growing organic produce in their backyard. But continued research into cancer thrust them into a full organic diet. It was about two years later that the lymph nodes in Mason’s abdomen had calcified and sealed completely. “Mason’s cancer was gone. He’s healed,” Nicole said with a smile during the lunch break at the Cropstock work day. The result of the realization of what an organic diet can do led the couple to turn their attention to the small acreage they had originally purchased on Emory Phillips Road in east Coweta. Their research led them to conclude that the property could be put to better use as the location of a non-profit farm specializing in organic products. 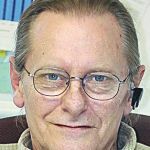 It was in December 2009 that, at the request of Scott and Nicole, the Coweta County Commission amended the county’s zoning ordinance to allow parcels as small as 5 acres to be used for farming. Scott in making the request said that the non-profit farm would establish an agribusiness and agri-tourism operation centering on organically-grown foods. The rest is history. Today the 180-degree Farm is beginning its third year. Aside from the growing number of customers wanting organic products, the farm is also a participant in the Community Supported Agriculture (CSA) program. CSA members support local agriculture by pre-paying for a seasonal food subscription. And the farm donates a portion of the harvest to food pantry ministries in Fayette and Coweta counties and to those who are sick and financially unable to buy healthy, organically-grown foods. Also by agreement, CSA customers donate their share of the week’s food when they are unable to make it to the farm on a given week. The list of farm-grown products is endless and is shows what can be done on just a handfull of acres. A small sampling of the produce includes potatoes, cucumbers, corn, tomatoes, broccoli, cauliflower, beets, carrots, kale, arugula, radishes, spinach, a variety of greens, sweet potatoes, melons, peppers, squash and kohlrabi. A sampling of herbs and flowers include rosemary, basil, cilantro, oregano, dill, thyme, mint, nasturtium, lavender and chamomile. Then there are the pasture-raised and grass-fed chickens, turkey and lamb. And no farm would be complete without eggs. At the 180-degree Farm that means both chicken and duck eggs. “Our chickens are free-range, grass-loving, bug-loving hens able to express their inner chickenness to its fullest extent. Our egg yolks are a rich, orange color full of vitamins and minerals. They are never fed antibiotics or hormones,” said Scott. The 180-degree Farm holds a variety of workshops on growing organic foods, food awareness and nutrition. The basic gardening class is full and will be followed on March 4 with the Rainbow Trout Fishing Day. Designed as a family outing and fund-raiser, anglers must supply their gear and can catch a limit of four trout per family with the minimum weight per fish expected to be at least 2-3 pounds. The price is $6.50 per pound and includes having a farm hand help clean the fish. Nicole and Scott’s church recently donated a modular building for classes and other uses. Additional needs include a well, septic tank, a parking lot, ADA compliant bathrooms and decking and a handicap ramp installed before the building can be accessed. Now farming nearly 15 acres, it is a far cry from the investment of time and energy required when they “farmed” in their backyard garden. Nicole puts in a minimum of 40 or more hours at the farm each week while Scott has his “regular” job and puts in the equivalent of a part-time job at the farm. But for Nicole and Scott Tyson, it is much more than time and energy. It was a 180-degree change in direction that is benefitting an increasing number of people who also did the research and found that eating food containing pesticides and other chemicals and food grown organically are two vastly different things. For more information on the non-profit 180-degree Farm call 678-464-6111 or visit www.180degreefarm.org.